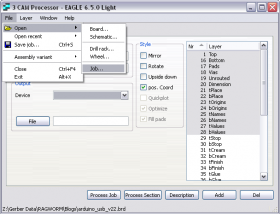 Since we’ve had a few requests on this matter, we decided to create a nice tutorial for all you folks that use Eagle as your CAM processor. 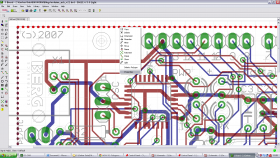 If you’re not familiar with Gerber files then you should know they’re the industry standard in PCB manufacture. They’re the blueprints of modern electrics, the drawings of creativity and the paths to the future. 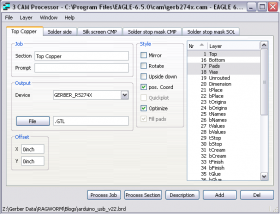 What you see below is an example of a PCB design in Eagle. Once you have finished perfecting your awesome bit of kit and want to get the board manufactured, all you need to do is send it of to Ragworm… but before you hand us anything you need to export these as Gerbers. If you would prefer the manual method for more control see below. To get the most out of the orange service we suggest a mass ground fill. Right click the outline either top/bottom then click properties. 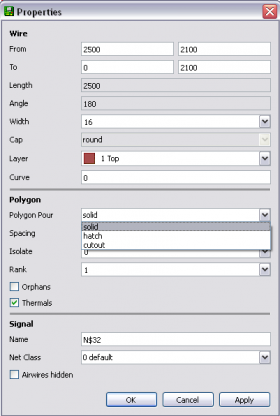 Make sure that the polygon pour is set to solid and click apply. Make sure it’s set to solid on both top and bottom layers. Final step to giving the boards a mass copper fill is to click Ratsnest. Now you need to export as Gerbers. 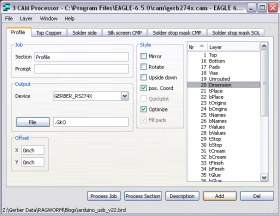 You need to load the CAM processer, this can be found in the file menu. 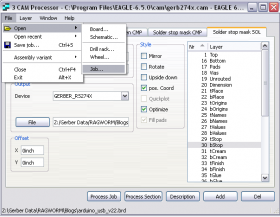 Once you have loaded the CAM processer you need to open a new job. For the Ragworm Service you will need to add a profile layer, For this click add and then rename the section to profile with .GKO as it’s extension, you need to select dimension for this layer. One vital thing is to make sure that none of the layers are mirrored! Once you’ve done this and chosen where you would like to save these files by clicking on output file, just click process Job. 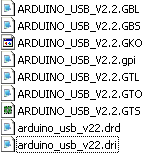 You should have a folder that contains these layers, You will notice that there is one thing missing, This is the drill layer. You will need to run the CAM processer again and open Job again. This time when you get into the option open the excelon file to load instead of the gerber file. Make sure that Drills and holes are both selected and then click process job. You will now have another two files in the folder. You have now successfully generated the Gerber files ready to send to Ragworm, all you need to do now is zip this folder and send into our online portal.